Working in the schools I am on my feet quite a bit. As a speech pathologist I am constantly back and forth getting students or on my feet in their classrooms. With all that time on my feet, it does not matter if I am in heels, boots, or flats, there are days where my feet and legs are in pain at the end of the day! I've figured out some tips to help my feet stay more comfortable that I am sharing today. 1. Try leather or suede shoes. These mold to your feet and wear better. They are more expensive up front, but far more comfortable and last longer as well! Scuffs or small scratches can also be fixed with a leather shoe that can't with a man-made material. 2. Don't lock your knees or pop your hips! I have had knee issues for a couple years that ended up with surgery and then physical therapy this last fall. One thing my physical therapist recommended is for me to stop popping my hip and locking my knees when standing. It puts all the stress of your weight on your ligaments. When you don't do that, the muscles take your weight. 3. Wear heels sparingly. I wear heels maybe twice a week. And my heels are all 3 inches or lower for work. That is a height I know is comfortable for me all day. Any higher and it would hurt. You need to find your sweet spot for heel height and how often you wear them. 4. Get yourself a good insert! This is huge. Even avoiding heels and wearing flats can hurt your feet if the flats are not supportive. A good way to solve that is to purchase a quality shoe insert that you can place into any shoe you wear to add support and cushion. I have been using Hydrofeet inserts and absolutely love them. 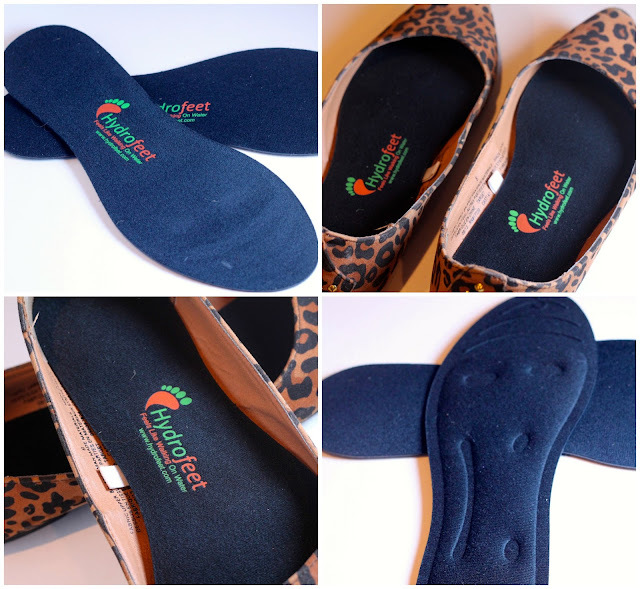 Hydrofeet Insoles are filled with a vegetable-based, pharmaceutical-grade, FDA-approved glycerin and unlike rubber, gel, or foam inserts. Hydrofeet Insoles last longer, and were found to have 50 times the viscosity and strength of regular insoles! They honestly feel like you are walking on water and I notice a difference especially in my heels and arches. You can purchase them on amazon here. Hydrofeet inserts offer better stability, and less impact for your feel They help prevent or address common foot problems such as sore, tired feet, plantar fasciitis, bunions, knee, hip, and back pain, heel spur, heel pain, corns and calluses, and poor blood circulation. You can find Hydrofeet on facebook, twitter, pinterest, and google+. 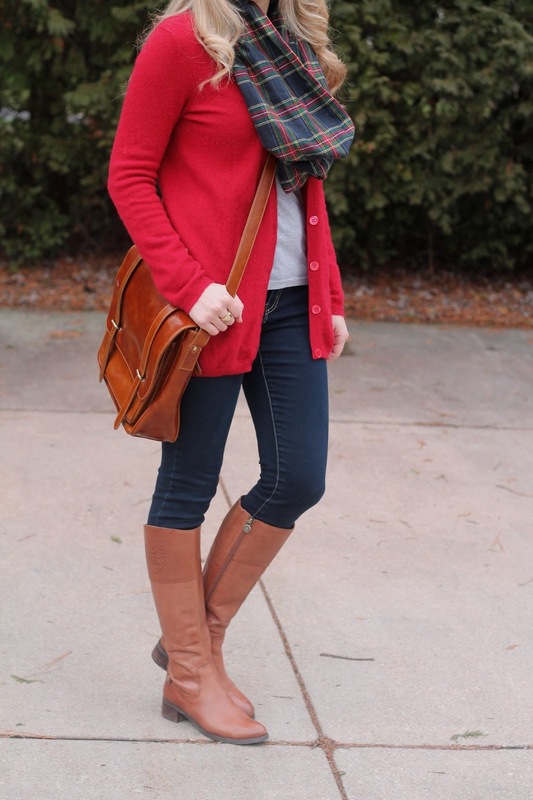 Love the red cardi, classic outfit. Not locking your knees and popping your hips is one I never thought of! It makes sense! I love the red on you! This is such a cute, classic look! Great tips! I need some inserts for my flats! And of course looking gorgeous per usual! Love the red! These are great ideas. I've never thought of not hip popping or locking my knees. I use inserts for my running shoes, but I should get some for some of my flats as I feel they have no support! I always try to not lock my knees when I am standing, too! Thanks for sharing your tips - insoles are great, I've been adding some cushions to my heels and it's makes such a difference! I really like this outfit, Laura ! The colours in this outfit are so pretty! I've also been told that locking my hips/knees is a bad habit, but I always find myself doing it anyway! All great tips - I agree with the leather/suede for shoes. I know when I am going to walk a lot - if I don't wear flat shoes, I will end up with blisters and pain! I agree that wearing heels sparingly really helps! I went from wearing heels 7 days a week to wearing flats almost every day after my knee injury I definitely see heels as more of a special occasion thing now rather than everyday, and my knee is much better for it! 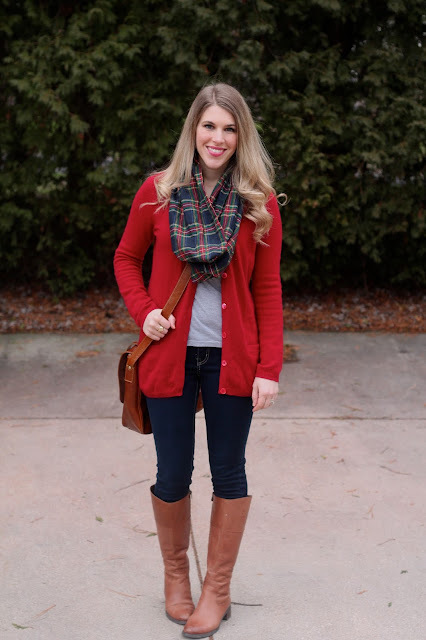 love the red cardi with the plaid! i am the worst at locking my knees. my whole familydoes it, a friend pointed out to me once. Great tips. I wear heels a few times a month but practically live in flats or boots so these would be great soles. Great post and tips on how to keep our feet comfortable, and these soles seem ideal! Great tips! I never knew about #2. I often pop out my hop when standing for a long time. I'll have to try to not do that. And those inserts look so comfortable! These are great tips, and things that I had no idea about (like the knee locking and hip popping... who knew? those sound like dance moves...). Also, those inserts sound great. My job right now involves a lot of sitting (which is sometimes even worse!) but they would be good to keep in mind for days I'm going to be walking around a lot. Good Tips! I didn't know that about your hips... mine kind of do that naturally. I love wearing heels too, and since I don't walk a ton for work I try to justify it. Love your outfit! Great tips, Laura! Hyper extending my knees is a big one for me too. I have to constantly remind myself to knock it off. Thank you for sharing these! 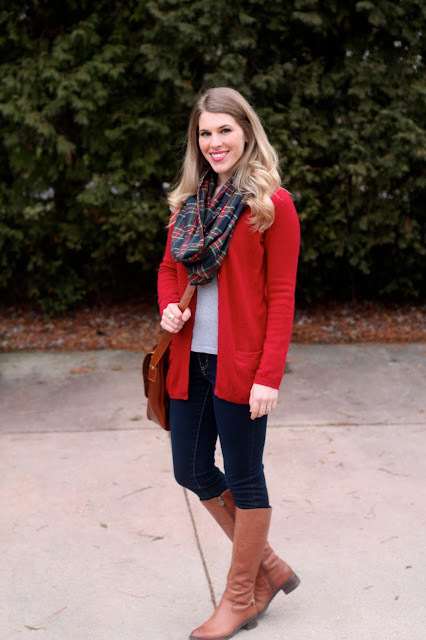 Great layered, winter look and tips! I do wear heels pretty much every day during the week, but I am mostly behind a desk. I need to check out these inserts - they sound really comfortable. Thanks for linking up. I will have to look more into these insoles. I wear heels pretty much 5 days a week. I am 100% with you on tip 3 and 4 and I had no idea about tip #2 so that is great advise. 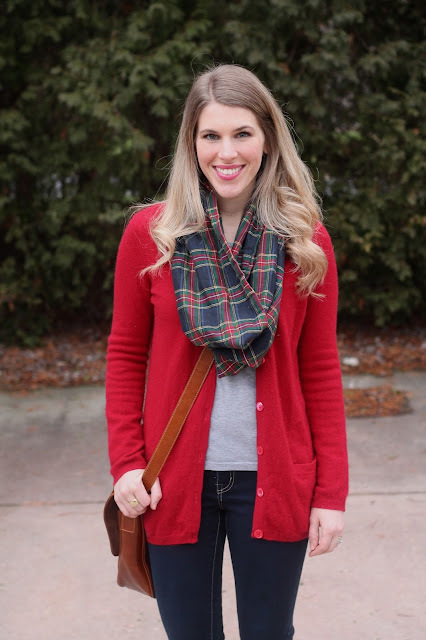 How have I not tried one of my plaid blanket scarves (which has red on it) with a red cardigan yet? Such a great look with yours.